The goal for this redesign was to struck a balance between interior design and lighting concept and let the light concept not fall behind. The final result is a spectacular display of what is possible with LED technology, brought together in a consistent concept with lots of interesting details. Special focus lay on working with the available space and architectural structure of the place and thereby creating interesting effects in perspective and all three dimensions. 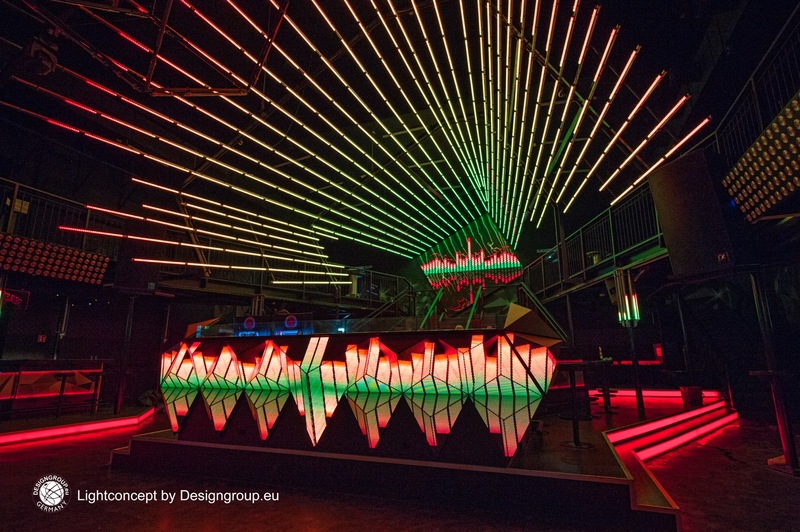 Dubbed ‘Explosion Stripes’, this main lighting installation nearly creates an optical illusion. It itself is an extremely complex steel frame construction that spans over most of the available free space and creates the distinctive character of the main room. 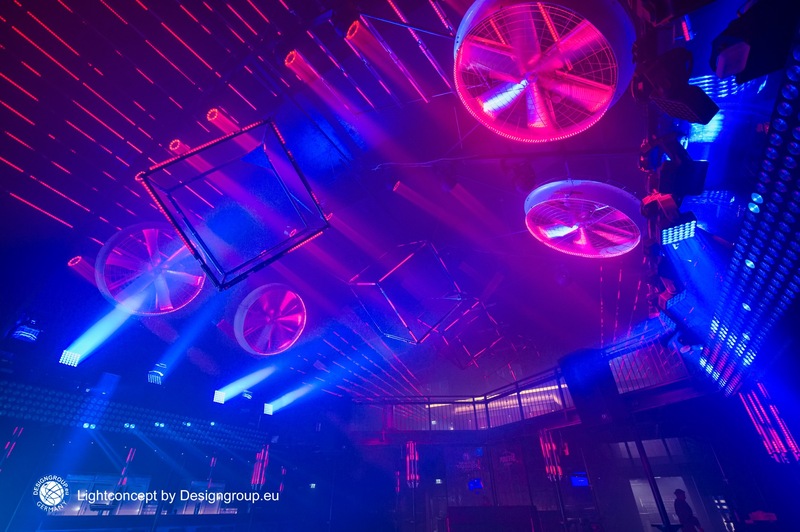 Over 900 meters of aluminium pipes form the base for this lighting setup on which over 700 meters of LED stripes are attached. A more delicate, custom-made steel construction was deliberately requested over regular trussing in order to leave it wide open, to allow guests to see the dance floor below, and thus to not block the view from the gallery. 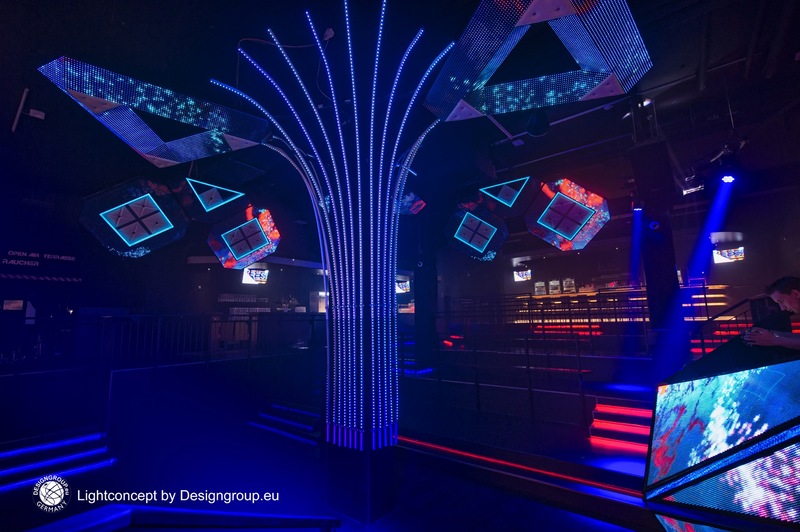 Each stripe is built as tube with 32 individually controllable LED light points for pixel mapping, resulting in an amazing light installation with impressive light shows that achieve full effect with suitable effects and video clips that were created especially for this purpose. 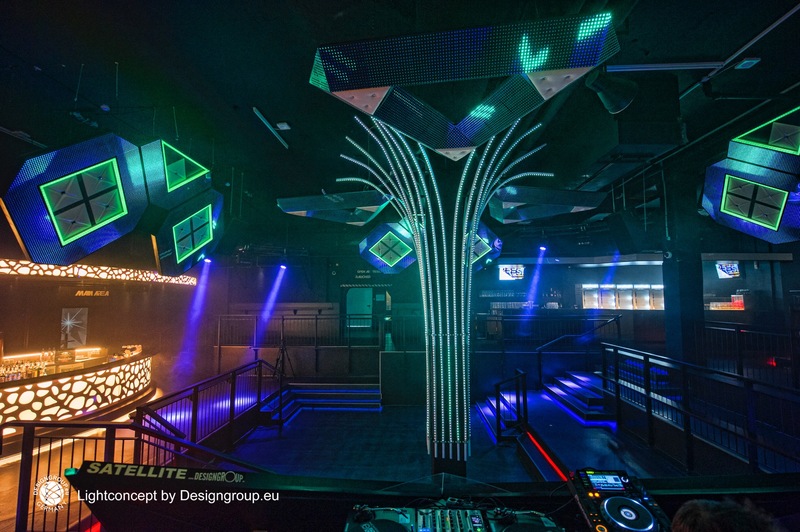 These support the spherical impression of the installation and each stream leads to the huge, sloping LED pixel wall with 4 m by 4 m in total size and P10 pixel pitch. 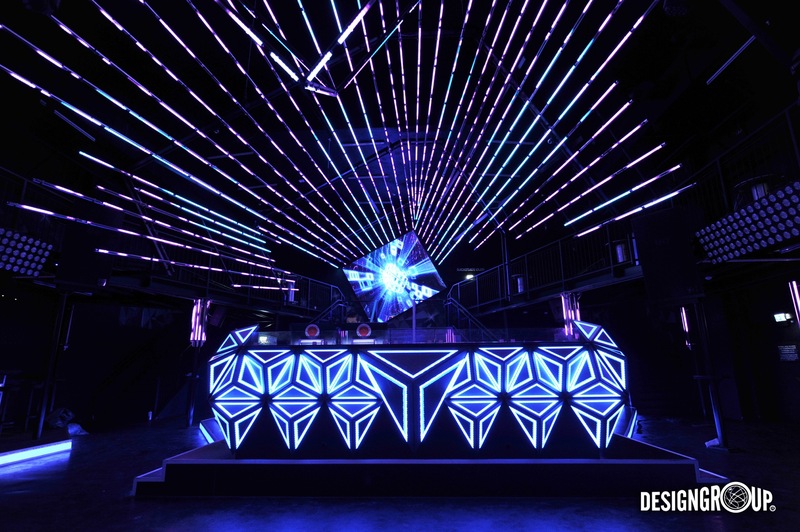 In front of it, a towering multimedia DJ counter with 5 mm pixel pitch was placed with its length of 4.80 m and height of 1.60 m.
5 3D LED cubes (140 cm x 140 cm x 140 cm) are another highlight that fit well in the overall design. 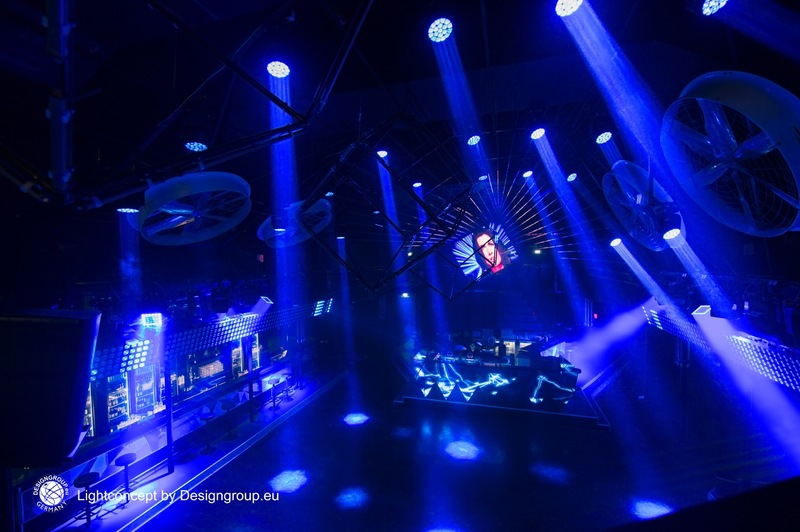 16 6×6 LED matrix moving heads, 30 LED COB spot blinders and 21 LED beam moving heads complement the lighting concept and were placed between the single frames. As a very special effect, 4 axial radiator fans were installed for show effect in fibreglass as they measure in fact 2 m in diameter. The main challenge of this project certainly was the installation of the steel construction. It had to be fitted properly and mounted in the correct way and fixed to the balustrade of the gallery. Working in large heights and ensuring the workers’ safety was no less challenging. On top, visitors on the gallery had to be prevented from touching the equipment to ensure safety of both, the visitors and the technology. This required a lot of careful planning and many angles and positions were tested for the steel frame prior to installation. Everyone is extremely happy with the final result to due the optical illusion that could be achieved when looking right up to the LED wall. The impression of the room is that it seems to be longer than it really is. 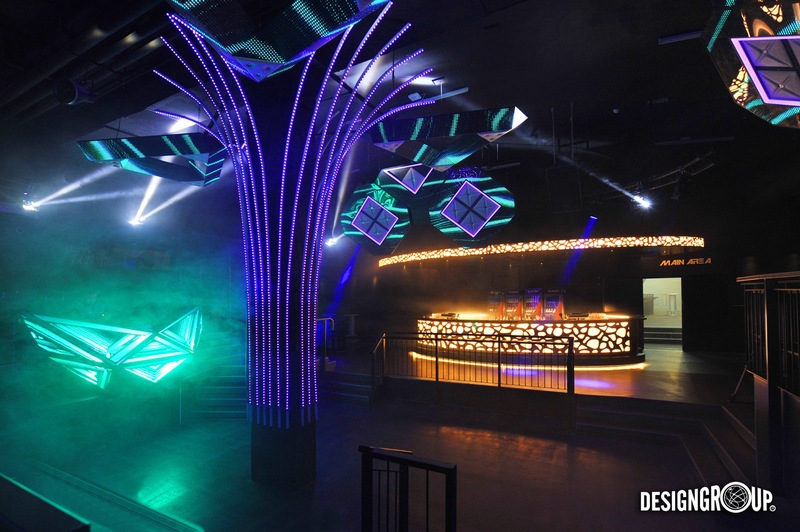 Likewise, we redesigned two secondary areas, the entrance hall as well as the backstage club. Highlight for the entrance is the ‘Running Points’ installation: 130 m of LED stripes mounted to the ceiling in parallel rows and controlled by one MADRIX PLEXUS in stand-alone mode. 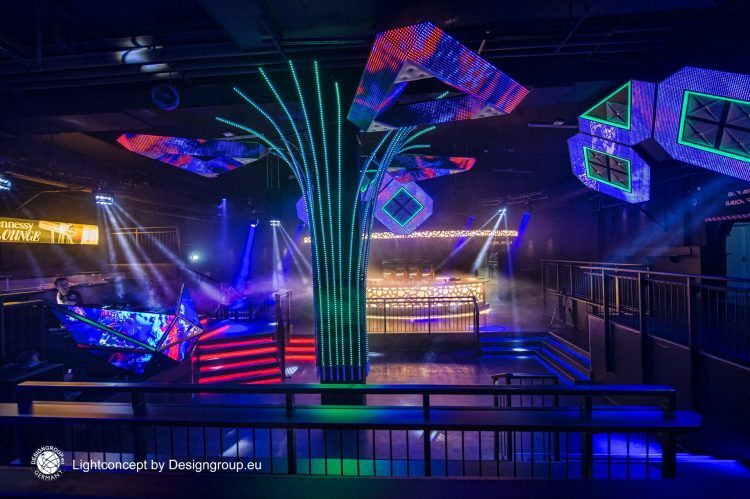 Highlight of the backstage area is the ‘Rainbow’ installation: a flexible construction around the main column of the dance floor which is equipped with 50 m of LED stripes as well as multiple LED design objects along the ceiling.